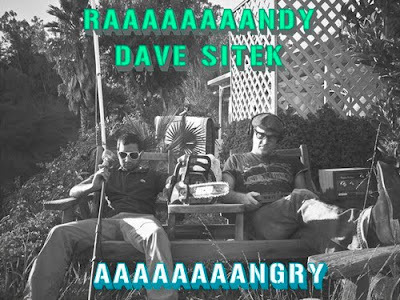 ElectricMustache - Indie Rock Blog: mp3: Raaaaaaaandy & Dave Sitek - "Aaaaaaaangry"
mp3: Raaaaaaaandy & Dave Sitek - "Aaaaaaaangry"
Okay, I'm late to the party on this one but better late than never, I say. Hopefully by now you've seen the hilarious videos made by Aziz Ansari as part of his character in the movie Funny People. If not, just skip to the next post. Still here? Good. So yeah, the Raaaaaaaandy character has really caught on and most recently Aziz, as Raaaaaaaandy, has teamed up with Dave Sitek to release his own mixtape. You can listen to the hilarious track "Aaaaaaaangry" down below. This is pretty much the funniest song I've heard...ever. Enjoy! Raaaaaaaandy & Dave Sitek - "Aaaaaaaangry"